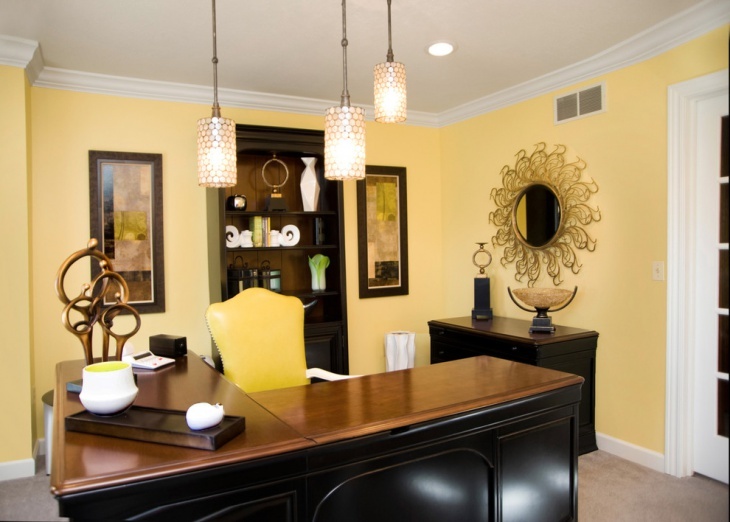 If you want a contemporary look for your yellow home office, the best thing that you should do is to make it as space-saving as possible. 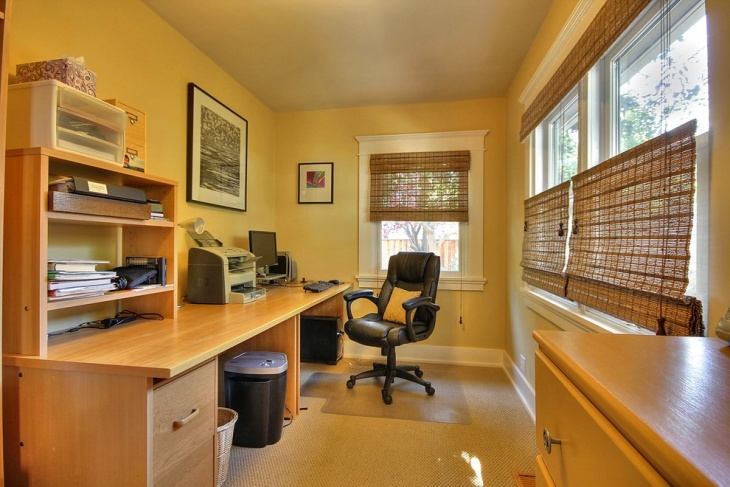 With that said, you may want to try this one side home office design. The table is built from one wall to another wall, with drawer file cabinets installed under the table. For additional storage, two sets of four-layer shelves are attached to the wall above the table. A memo board serves as a focal point decoration between the two sets of shelves. The choice of light yellow as the main color indicates a reserved and traditional nature. If this is want you want to achieve, then this room should be your inspiration. The shade of yellow, the L-shaped desk with solid wood top. 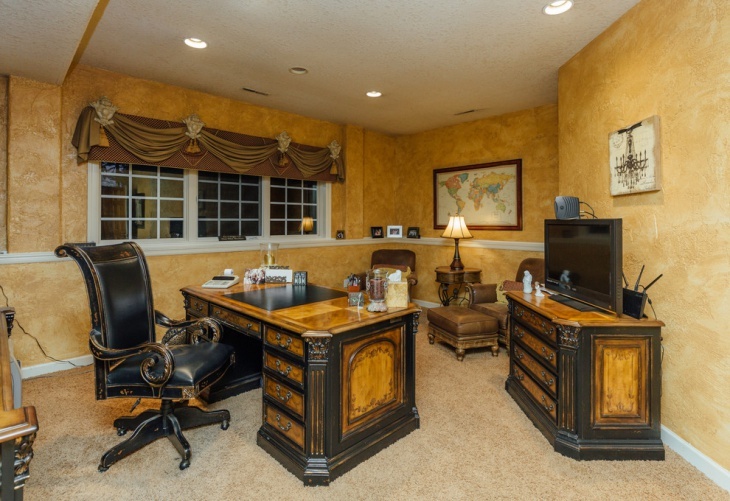 The leather office chair clearly indicates that this is the home office of the man of the house. 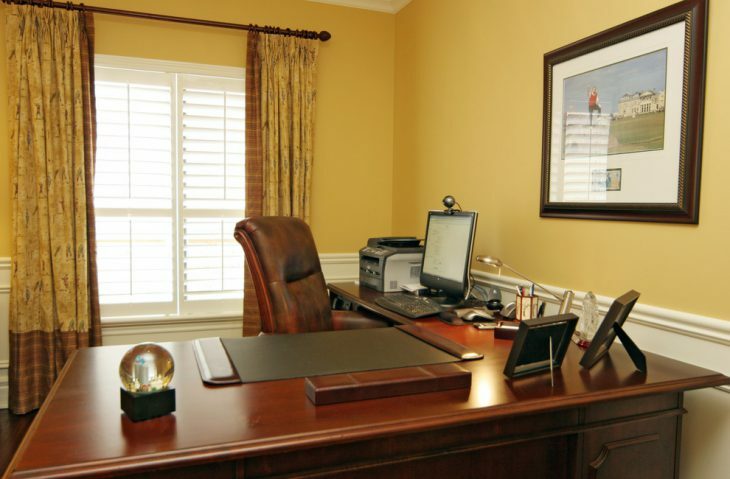 To make your home office more personal, take a hint from this room and add some touches of your hobbies or sports. For this room you can see golf-inspired framed picture and drapery. Apparently, the owner is an golfer. Are you looking for a colorful home office inspiration? And you also want to use yellow as a main color motif? You can achieve that desire and you can even get the bonus of having an industrial space with a colorful atmosphere. First use brick walls (for the industrial look and for the shades of red). 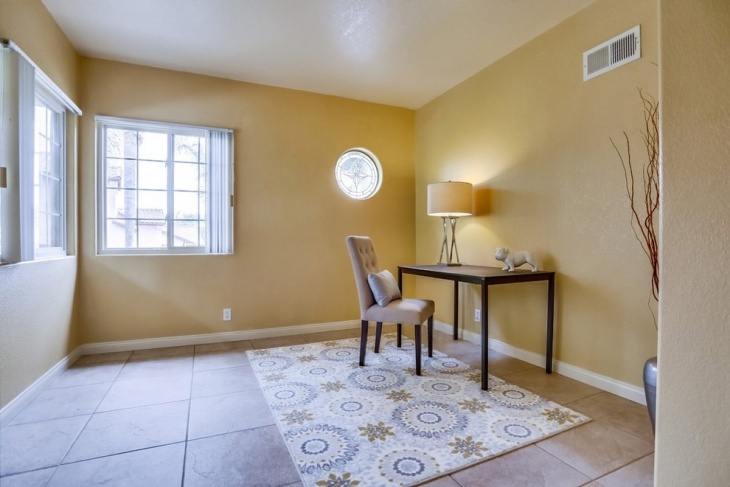 Second, use a subtle shade of yellow (like the one used in this room) for the cabinet and desk ensemble (paired with a dark colored leather office chair) and the fixed bench on the other side of the room. Third, create a contrast with a pink desk and two wing-backed chairs. The result, a beautiful fusion of texture, color, efficiency. If you want a dark colored wall, yet you also want the yellow shade, you’re best options is to go for the honey or mustard shade of yellow paint. 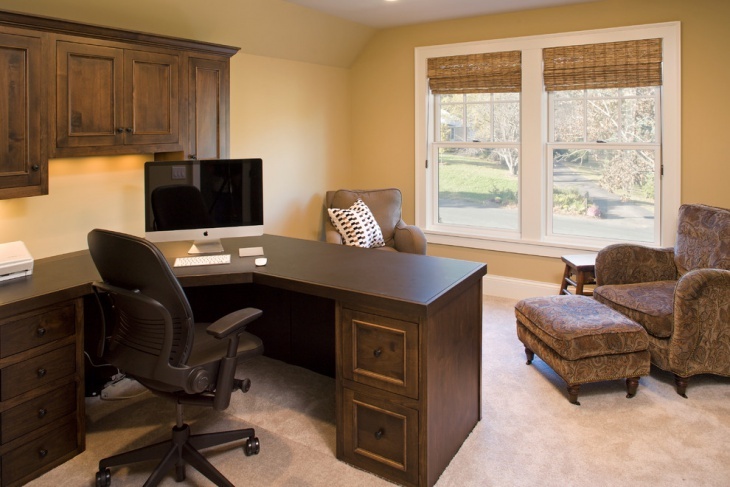 Match the walls with dark wood flooring and you will surely achieve your home office vision. The combination of white and yellow is something truly eye-catching. You can use these colors dor your walls and ceiling. Horizontal stripes on the wall is something quite modern. The classic twist is the use of the chandelier and a traditional wall accent (in this room, the moose head. If you also want to include sustainability into your home office, you can use an old dining table as a desk. Pair that with a white executive chair and you got a winner. Creating an eclectic designed room is not just about painting it in multi-color, placing any kind of furniture into the room, and accenting it with whatever you can get your hands on. The best way to achieve an eclectic look combined with some professional appeal is to choose the accents that you are going to use. 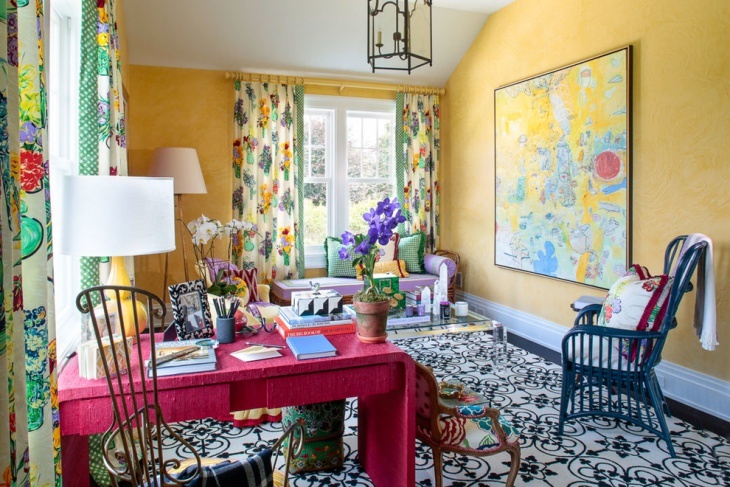 Textured yellow walls, colorful drapery and artwork, pink desk, and heavily accented rug – these are the things that made this specific room perfect for that eclectic character in you. 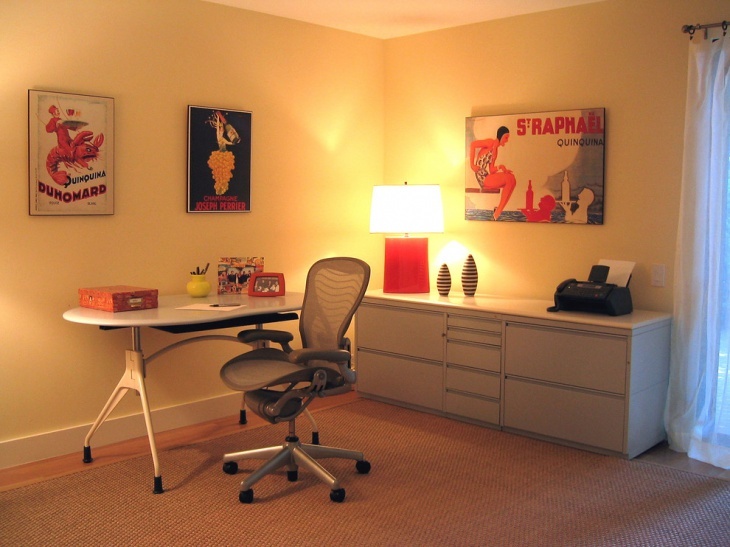 This home office design is very simple and minimalist. 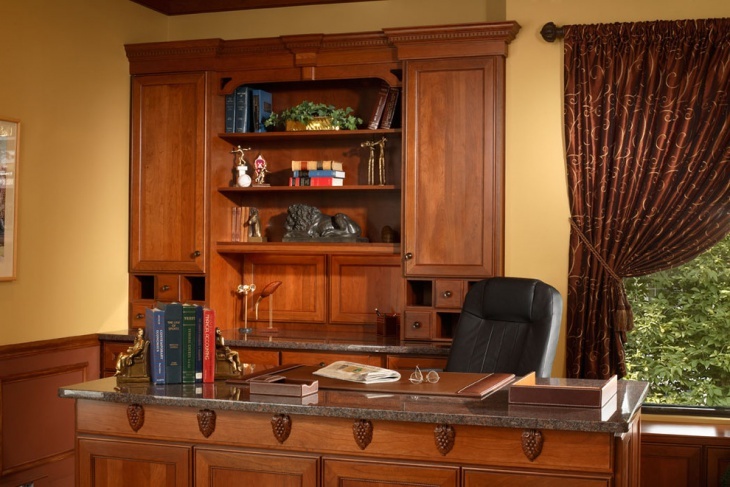 Wooden desk is placed diagonally on one corner of the room and facing a wide window. The walls are two-toned – white on the bottom and yellow on the upper part. The only accents are the unique wooden bookshelf, white rug under the desk and the framed photographs one the wall. 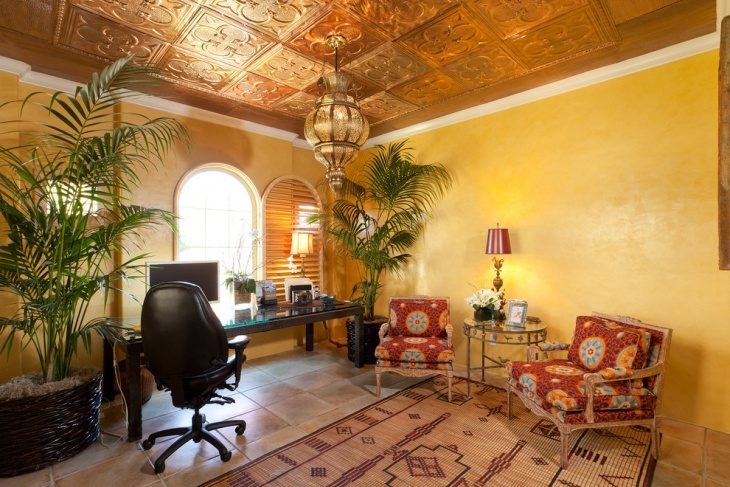 The rustic look on this yellow room is achieved by wheeled craft table (that also serves as a desk) and placed in the middle of the room, tall office/lab chair, wooden cabinet, and the unpolish look of the flooring. 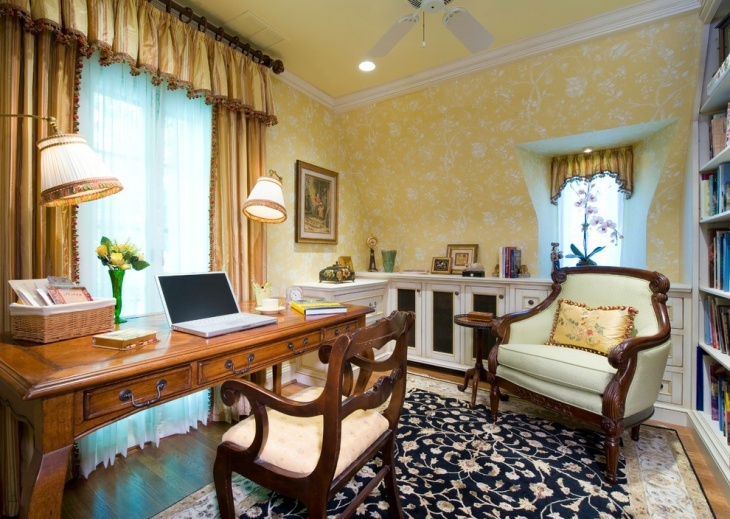 The floral design in the walls enhanced the homey look of this home office. 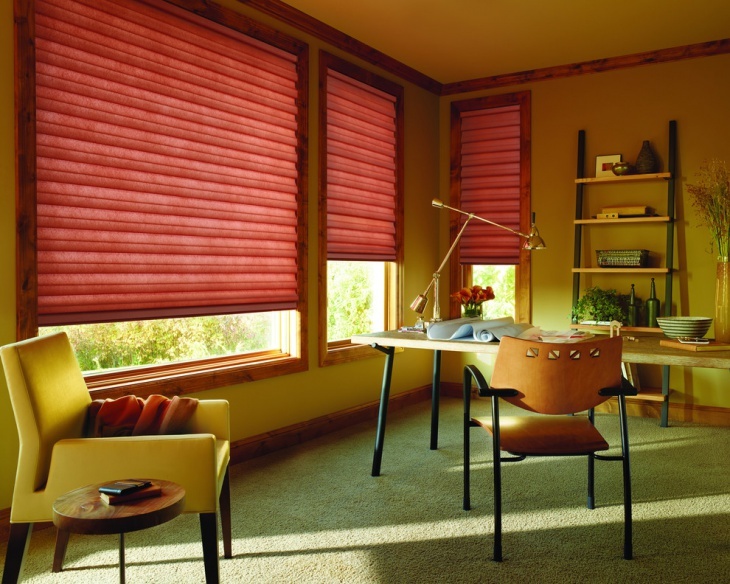 The tall window allows better and natural lighting, which makes for the best place to set the chair and the desk. The painting on the wall serves as nice accent to the room. 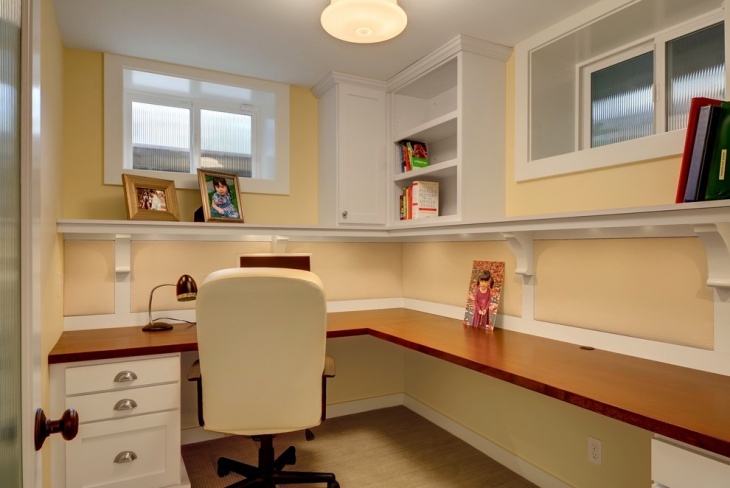 Pale yellow is the motif for this room and the long built in cabinet on one wall serves as the desk, shelf and storage. The opposite wall has two windows with blinds and there’s another window on the middle wall.